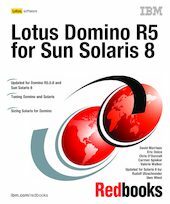 This IBM Redbooks publication tells you how to run Lotus Domino R5.0.8 on the Sun Solaris 8 Operating Environment. (It contains information that has been revised and updated from the previous edition, which addresses Domino R5.0.2a and Solaris 7.) While the Lotus Domino server is platform-independent, each platform it runs on requires some additional platform-specific knowledge and configuration in order to ensure it operates efficiently and at maximum capability. The primary focus is to explain the installation, configuration, and performance tuning of Domino R5 in this environment. We take you through all the steps required to run a Domino R5 server on Solaris 8, from choosing the right hardware, installing Solaris and Domino, tuning the OS and the Domino server and performing administrative tasks, through to problem determination and troubleshooting.